A massive piece of Kylie news dropping out of Australia tonight, with news that Warner Music Australia is set to release this incredible Kylie Minogue singles boxset! Entitled the ‘Kylie Time Capsule’, it’s set to feature 25 collectible mini discs featuring all of Kylie’s extraordinary hits since the release of ‘Locomotion’ back in 1987! It’s due to drop in late October and it can be pre-ordered now from right HERE! After being a fan for 25 years and waiting patiently for a singles boxset to be released I have to say im totally dissapointed. Why couldnt something really special have been done. Its being called a timecapsule so why not create cylinder of metal to look like a timecapsule maybe with a combination lock on it using the Australian release date of the locomotion? CDs to represent every kylie single. Cardboard sleeve that are round that seperate in the middle but once together they look like picture disks and being round they would sit nicely in the capsule. Each disk should have featured all tracks and b-sides connected to it maybe even with a brand new recording exlusivly for this fan collection. A DVD and blu ray featuring all kylies videos, live footage, rare interviews. The capsule could sit in a nice wooden box containing a full international discography book featuring all album covers and chart positions around the world. this would have been the perfect oportunity to create a truly amazing item thats would not only be a complete collection but a unique work of art. Trust me on this one, the tracks that will be included shouldn’t be the album versions. Some aspects have been thoroughly checked. So, EMI / Warner have had all year thus far to come up with this…and after the delays with the Goddess Edition pop up book they should realise we are expecting the best? Do I need to mention how lazy the Very Best of CD/DVD was a couple of months ago? What fails here is no concept of giving what us fans what we want. Many of her early singles were hard to get on cd single, so why not touch that fan base and replicate b sides, remixes & cover art from around the world? This box set will just be a box of cds that will never be played. So for all the initial excitment from other Kylie fans, just sit and think, ok, $100 a pop for a paper weight really. labels, it’s time to consult die hard fans because causal Kylie fans who might like one or 2 albums will not by this and us fans have so much of her back catalogue 3 or more times over! EMI / Warner, you should refer to recent Girls Aloud / Rolling Stones singles box sets are done, all done with style and dedication by Universal Music. What would have been nice, to tie in with the Locomotion love of last week, was to finally replicate the Australian single release on cd single with the 12″ mixes, b side & the Abbey Rd new version and also release a picture disc 12″ vinyl! There are also many rarities that deserve to be mastered and finally put out onto the retail market, I’m sure many fans would like proper versions of Aston Martin, Stay This Way, etc.Or the Anti Tour on DVD / CD. We have been celebrating Kylie every single year since 1987 so this K25 is very much for the fans and Kylie! Enough’s enough. Kylie is WELL past her use-by. Icon, yes… but please, it’s time to stop. If I’d have compiled this it would have been at least 50 singles with original b sides and mixes with a book featuring a worldwide discography with photos of sleeves from around the world. I’d also add random copies of Getting Closer in the first 100 preoders just to make the internet go crazy. We’ve not been advised of specific numbers, but yes, very limited edition. 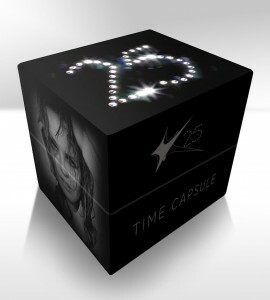 Can you please tell me how many of these Kylie Time Capsule cd single boxsets will be being made worldwide?, as i have heard that it is going to be a very limited edition release is this correct?. What looked like a great idea only got worse when you read the description. So most of Kylie’s singles, two to a single, and apparently according to fans they’re album versions. If they re-issued all her singles with original tracklisting and artwork it would be a no-brainer. Come on, it’s K25! Give us something more than a cheap knock-off! Just 2 songs on a 3″ CD? What idiot thought of this? Apparently each CD is a 3″ CD single! So I’m confused, each disc contains just 2 songs?